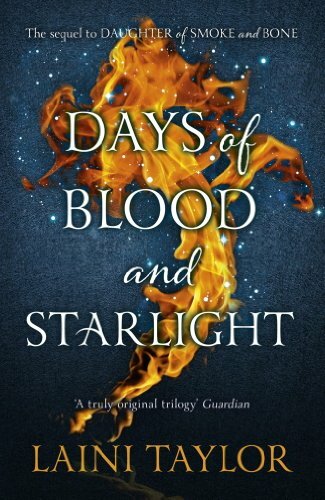 ‘Days of Blood and Starlight’ by Laini Taylor is the second book in the ‘Daughter of Smoke and Bone’ series, easily one of my favourites of 2011 and 2012, if not stealing the top ranking position. This book picks up where the first left off, back in Prague with a line that again makes me determined to someday visit. We start with Zuzana, Karou’s best friend, and Mik, Zuzana’s boyfriend. Thankfully, they’re still together, and isn’t it good to see a steady relationship that lacks drama and is simply dependable in YA. Kaz is still an element in the novel, but thankfully not for much of it. He is sapping up the attention Karou and Akiva have caused much to Zuzana’s disgust. At least it provides a distraction from the fact Karou still isn’t answering her phone, and Zuzana has no idea where she is. Neither does Akiva. When he thought Karou – well, Madrigal – was dead, in his utter hatred and anger for the chimaera without thought that they may have their own plans in mind… he caused their destruction. Everyone Karou loves is gone – including Brimstone. Although Karou loves Akiva more than she thought possible it’s not enough to keep her by his side, and she leaves, unable to cope with the idea of what he’s done. As if that’s not enough, the war between the angels and chimaera continues with ever decimated numbers. Without Brimstone, Issa, Yasri and Twiga, they have no resurrectionist. Karou must take her place with her people – but of course out of the few survivors, Thiago, her murderer, is one of them. Can Karou turn away from Akiva forever and stand beside Thiago for the good of their people? Throughout this book we get to see more of Zuzana and Mik, as well as Liraz and Hazael, those Akiva calls his brother and sister. The cast also expands to other chimaera who have so fair survived the war to be brought back to a new body, showing another dimension to the previously mostly-earthbound series. Akiva’s siblings are easily the most interesting, as they must choose between what they’ve been trained to do and believe in, and the brother they love, trust and believe in. The plot goes from strength to strength, surprising the reader time and time again with deep and meaningful (rather than cheap) tricks to enable things you wouldn’t think possible. The plot goes where you wouldn’t expect it to, and we can breath a sigh of relief for the characters when they manage the impossible. The tone is rather different in this middle book (yes, sadly we only have one more book to live for!) as Karou has changed from her magical, hopeful self to one who is determined and wiling to put her hopes and dreams aside for the good of others. What really stands out however, is Taylor’s way with words. She really captures the mystic and wonderful value that can be found in every day life, through terrible times and simple times, in our human world and war. The fight scenes come alive and emotion is vibrant whether it be joy or sorrow and anguish. I would say that this series would be beyond fantastic as a movie, if only movies weren’t so often changed far from the book and done so poorly. Perhaps a television mini-series instead. Simply put, this series has earned a special place in my heart for so few books – it’s been regularly commented that I’m a harsh reader. This has won it’s place right up there with Scott Lynch, J. K. Rowling, Brandon Sanderson, Patrick Rothfuss and Tansy Rayner Roberts – probably the one it’s closest to. This review was originally posted at SentientOnline on the 26th November 2012.